My novella LEGION came out a month ago in hardcover and two weeks ago as an ebook. Now the audio version is available for download. 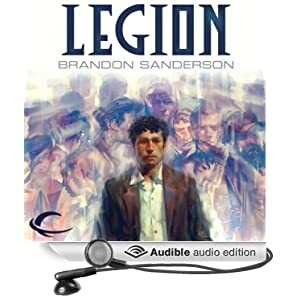 Until the end of 2012, the Audible version of LEGION comes at a price of $0.00. (Steep, I know.) It's read by Audie Award-winning narrator Oliver Wyman, and the audiobook is unabridged at a little over two hours long. One nifty thing Audible has started doing now is their new Whispersync for Voice capability. If you have the Kindle version of the book, you can move seamlessly from reading the ebook to listening to the audiobook, and back, and it will keep your place for you. And if you have one of the three newest Kindle Fires, you can listen to the Audible version on your Kindle and have it highlight the text on the ebook as it reads it to you. I haven't tried this out (I have a Nook, personally), but it sounds very cool. One thing to note is that the Audible version is not available in UK/Commonwealth countries, but it should be available in most other territories. This may change for the UK/Commonwealth in the future, but possibly not until March or so. Sorry! Also, it SHOULD be available in Canada, but they had the wrong box checked in the backend, so you Canadians might not be able to get it immediately. They're working on that and should have it fixed soon. Another announcement for today. Tonight I'll be a guest on Pat Rothfuss's The Story Board along with Cherie Priest and Terry Brooks to talk about plot and structure for an hour. This is hosted by Geek & Sundry on their Google+ page, and it will be a Hangout on Air so you can watch it live. It will also be recorded, so once it's finished you'll be able to find it on their YouTube channel. Previous episodes (with different guests) are available here: Episode 1 (on urban fantasy), Episode 2 (on characters). The episode will air live tonight at 9:00 p.m. Utah time.